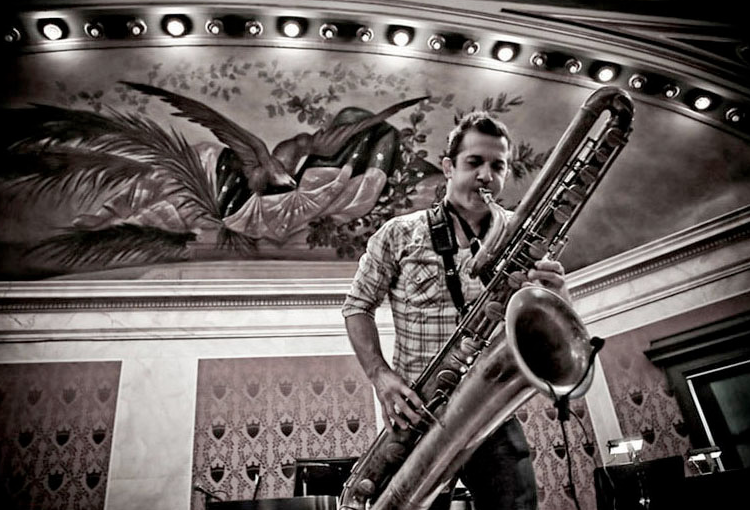 Praised by Justin Vernon (Bon Iver) as “one of our greatest living saxophone players,” Colin Stetson has collaborated with an array of artists, from Tom Waits and Jolie Holland to Arcade Fire and TV on the Radio to Laurie Anderson and Feist. He’s currently touring with Bon Iver. That kind of versatility marks this Montreal-based musician’s solo work — in which he uses saxophones, clarinets, cornet, french horn and flute to experiment around the margins of drone-rock, minimalism, and out jazz — as well. For his free Sound Horizon performances this Thursday — the last of this year’s series–he plays beneath Ernesto Neto’s otheranimal in the Walker’s Perlman Gallery. We caught up with him recently to answer some of life’s most — and possibly least — pressing questions. What is your favorite film scene? The opening scene from The Thin Red Line. Name one surprising aspect of your morning ritual. What artists are you most interested in at the moment? Stetson performs at 6, 7, and 8 pm, Thursday, May 10. Admission to the Walker galleries is free from 5 to 9 pm.